It’s been a long hot summer already so a few days exploring the northern coast of NSW with some cooling sea breeze sounded particularly appealing. This area has a lot going for it. Sparking waters and soft golden sand beaches. Rugged headlands and strong surf. Stunning views and green countryside. Not to mention wonderful restaurants making the best use of the fresh local produce. This peninsula and headland is significantly less populated than the beaches to the north and south, one side runs along the Tweed river and the other along the coast with expanses of beautiful sand beaches, a headland where you can regularly watch dolphins play in the surf below or whales pass in season. Definitely take a walk up to the lighthouse for its amazing views and to see or climb down to the Echidna rock and start of the Giants Causeway, a lava flow from the now extinct Tweed Volcano out to Cook Island. Significantly smaller and less well known than the Cook Islands, it was never-the-less named for its discovery by navigator James Cook who sighted it at 5pm on the 16th May, 1770, three years before his first visit to the more famous group of islands. Cook Island is an aquatic reserve and protected area. It’s a significant breeding area for seabirds predominantly terns and shearwaters. It’s also an important habitat for green turtles, stingrays, sharks and fish species. Cook Island is only 600 metres offshore from Fingal Head but the surf in the area can quite often make it almost impossible to get out there safely as it did unfortunately last week. Still on an good day it’s an excellent destination for kayaking, boating, snorkeling and diving and I definitely have a kayaking and snorkeling trip planned when the weather and tides co-operate. There is a bit bigger township here, large grassed reserve areas with children’s playgrounds and other facilities. The beach is again beautiful with golden sand as far as you can see. There was a surf patrolled area for safe swimming and lots of space to enjoy, it really is impossible to choose a bad place to stop along this coast. There’s also a bike and walking path that runs right through Kingscliff and south as far as Cassuarina Beach. I must admit this family of endangered Bush Stone Curlew under one of the pandanas trees stole the show for me though. These cute but dopey looking ground dwelling birds do choose the worst places to nest but they are experts at disappearing on the spot, the chicks particularly appear to vanish and reappear into thin air. A surf beach with life savers on duty, with three resort complexes and residential housing developments in the area it’s popular for family swimming but still a quiet beach even by Australian standards. There’s plenty of room here to walk, stake out a good sized spot in the sand or organise a game of beach cricket. There bike path runs through here from Kingscliff in the north to Cassuarina Beach to the south. Several of the resorts offer bike hire options so you can explore if you haven’t bought your own. The walkway here from the Cabarita carpark and reserve is a must do if you are passing. Enter through the Pandanas walkway which provides some shelter from the heat of the sun then climb the stairs and formed trail to the top. It’s only 1km return and has something for everyone with great views, regular spotting of whales in season, a great vantage point to watch the surfers, see a variety of local birds and get a bit of exercise. To the north you are looking at Diamond Beach and the patrolled beach of Cabarita, to the south is Maggies beach with sand stretching off for miles to the next headland. We just had a short stop here but if you’re prepared with the right gear – either a kayak or lots of mozzie repellant and walking boots, this looks a beautiful area. I would have loved to get out onto the lake in a small kayak, the water was incredibly still. The morning was a little overcast early on but that only added to the mood and tranquility here. There are 137 species of native animals birds and reptiles recorded in the immediate area and of those 19 are listed as threatened so it’s an important habitat. Tread carefully and enjoy. Continuing south on the inland side of the road is another great kayaking area. If the tide is right, from the bridge you can spot a variety of bird life on the sand island that appears in the middle, we saw egrets, spoonbill, a beach stone-curlew and pelicans amongst others. Also don’t forget to look up, there’s an osprey nest on a power pylon platform, when we visited a week ago it had two fledgling chicks occasionally showing themselves to call in the parent birds but not yet read to make the jump themselves. On the beach side of the road the creek forms a tidal lagoon which makes a lovely safe swimming and water lounging spot. As the tide goes out you should take care with children swimming as it’s quite fast moving as it heads into the ocean but the rest remains quite safe and several families were having a lot of fun floating down toward the bar on inner tubes. Across the lagoon (you’ll want your swimmers on to walk across) is the surf beach and still more golden sands. 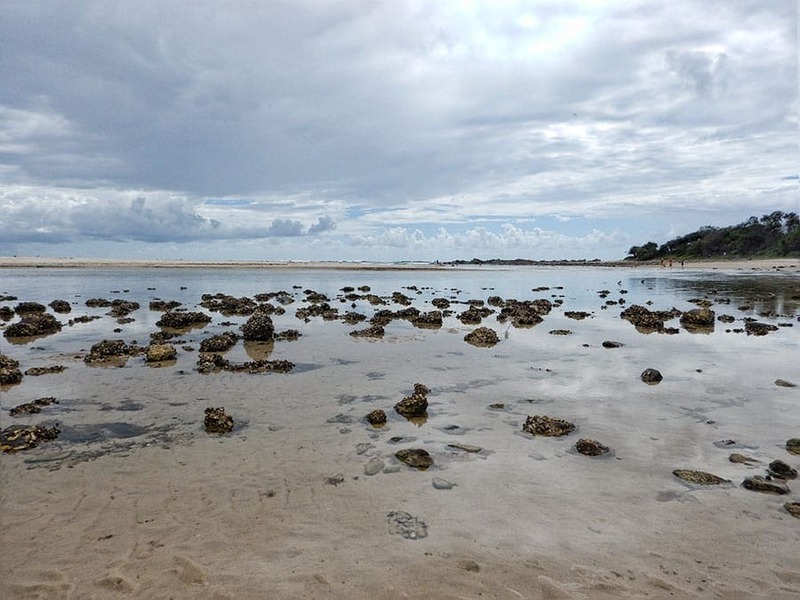 Walk along the beach or in the shallow sandy waters of Cudgera creek until the beach becomes rocky and you’ll see plenty of seabirds including possibly the rare little tern as you head towards to surf. Either clamber over the rocks checking out the rock pools or climb up on to the headlands for great views out to sea and of the beaches in either direction. This would be another great whale spotting location in season and on the day we visited the local high schools biology class had grids laid out exploring the rock pools and crevices. There’s a camping ground opposite nestled between the inland side of Cudgera creek and the beach. It’s a spot I’ll definitely come back to again. I think Cudgera Creek / Hastings Point could become a favourite. Often accommodation to me is about a clean place to shower and sleep but for this short escape we wanted somewhere to relax and do as much or as little as we wanted each day and the Peppers Resort at Salt Beach delivered. Located on the beautiful Salt beach you have everything you want within walking distance if you don’t want to drive. There’s a restaurant on site and a variety of cafes and restaurants just across the road, plus a convenience and bottle store if you wanted to self cater or grab some snacks. The location on Salt beach is stunning, sparkling clean water, surf, a surf-lifesaver patrolled swimming area, and miles of golden sand in both directions. The resort itself was a lovely respite from the heat of the day with a stunning lagoon pool and a quieter tropical pool towards the back of the resort. I’m not sure I’d be as happy there during school holidays but at the moment it’s a calm and beautiful spot. You can rent a tennis racket at the front desk if you want to burn off some energy or hire a bike and explore the miles of bike paths running along the beachfront into Kingscliff or down past Casurarina Beach. Clearly in this photo it’s an early post breakfast swim normally the loungers are full of towels and the pool well used but I couldn’t resist one final dip before we headed off on our last day when we saw it was totally empty! This is one very enjoyable pool to cool off and relax in. I’d definitely recommend a few days on the Northern Coast of New South Wales. It’s serene, scenic and full of interesting places to explore. If you’re passing through the area try to fit in a few days to enjoy what the Tweed coast has to offer. For those living or staying in South East Queensland it’s worth driving that little bit further on the weekend to spend time in this stunning region. The beaches and scenery are lovely if you like a bit of serenity and if you start to miss a bit of the noise and nightlife then the Southern Queensland coast is not that far up the road when you are ready to move on. What are your favourite spots on the Northern New South Wales coast? Do you have a local getaway close to home but far enough away to feel like you’ve escaped from the day to day routine? Gosh I can’t wait to get down there and explore some more. The last time we were there was 27 years ago! Before that we holidayed at Coolangatta and fished in the Tweed River. Fishing from the bank was so easy and even as kids we managed to catch a flathead or two. I love curlews too. We have quite a lot of them running around in the suburbs of Townsville this year – more than usual – but probably not the endangered ones. Still it is good to see them flourishing. Cook Island is a similar shape to others on the sunshine coast – must be something to do with the prevailing breezes. Awesome wrap of this part of the coast! We once spend a weekend at Seal Rocks just north of Newcastle a while back. It was part of a surf camp and was a lot of fun, but the beaches in that reserve are just spectacular. Thanks for sharing your knowledge and experience. I haven’t been to Australia yet but I would love to make it to the land down under as soon as I get a chance! Your beach photos are so enticing – I just want hop on over to the nearest beach as soon as possible! Salt Beach looks just so pristine and amazing – we don’t have beaches like that in Canada! I’d love to enjoy this sunny, stunning beach! How lucky that you can explore so many beautiful spots near your home. We live in Chicago and often head up to Wisconsin or over to Michigan for some R and R. Sometimes even an hour drive can take you to a completely state of mind. Your photos are gorgeous! Reading this brigs back happy memories of a year spent driving around Australia – I never got to stay anywhere quite as nice as that resort and spa though – It looks awesome! We’d love to get to Australia one day soon. The South Coast of NSW looks so beautiful and very enticing. All the destinations you listed look wonderful for a family visit. Previously, when I thought of Austrialia all I knew was the Opera House and Sydney. I love that I’m being challenged and my views widened. These scenic destinations make me want to hop in a car and drive to the nation’s utmost corners (and do some surfing and tanning while I’m at it)! This is such a detailed guide of places to visit in NSW. And I got to say it is really inviting. Love the beautiful photos also. Now I have to add NSW to my list. Thanks. Looks like you are having a lot of fun in NSW. How is the weather now? I hope it isn’t too hot! Oh I wish I’d had more time to explore NSW, when I was in Australia! The beaches look absolutely stunning. Cudgen Nature Reserve sounds lovely as well. I love Kingscliff for a quick getaway, we often go camping there. And Peppers at Salt holds a special place for us as this is where we escaped to for our initial honeymoon days before travelling Southern Africa. Lennox Head is another highlight for me on the NSW North Coast, and inland to Bangalow.